Tall for a woman, she is a lanky ghost of a person. 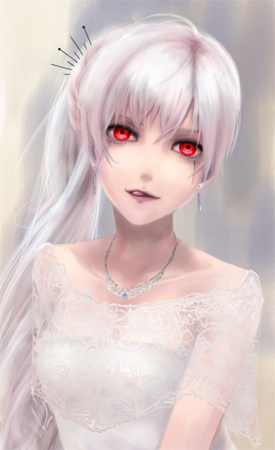 Her dark red eyes contrasted against her pale visage and white hair. Despite her somewhat awkward looking frame, she moves with a certain grace. Her movements fluid and with purpose. Her face is one of youth, but her eyes show signs of experience well beyond her years. Her face has soft, feminine features, but she lacks the curves many of her gender have. Despite her tall, thin build, what muscles she has appear to be very well toned. She is not exactly talkative, but she isn't exactly reserved. She knows exactly how much to talk, and when to. She is well versed in the ettiquete of many social strata, so she does a great job of fitting in, in just about every situation. She knows all the right things to say, and to whom to say them. She finds it easy to work her way in to any conversation. Little is known of Elise's past, likely due to the fact that she never speaks about it. This page was last modified on 6 March 2019, at 01:05.